This is a new printing of the original edition on sturdy, acid-free paper. 36 pages. Includes photos and list of organ music. Highest quality guaranteed. Size of music is 9.5" x 12.5". $17.00. 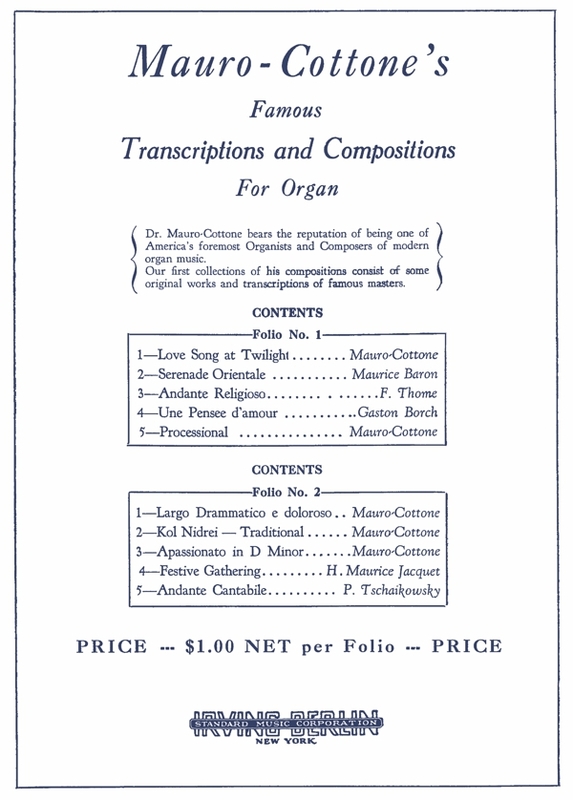 To order both folios of pieces in this series and receive a discount, visit the Famous Compositions and Transcriptions page and use the buttons there (instead of the buttons above). Melchiorre Mauro-Cottone was born on December 12, 1885, in Palermo, (Sicily) Italy. He was the son of Antonio Mauro (1849–1922), who was the son of Melchiorre Mauro, an organist and composer, and Giovanna Cottone. When he was 13, he substituted as organist for his father at the Church of St. Dominick in Palermo. After graduating with highest honors from the Royal Conservatory of Music in Palermo, Melchiorre was appointed assistant professor there at age 19 to work under his father, the professor of organ since 1896. When he was 20, he was appointed conductor of the Schola Cantorum Pius X. He married Rosa Varvaro in 1906, by whom he had two daughters, Gina (Mrs. Frank Pisant) and Aurora Mauro-Cottone DeCaro (1911–2006), a concert pianist. 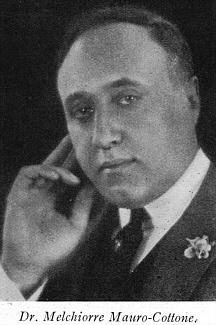 Mauro-Cottone emigrated to the United States in 1908. 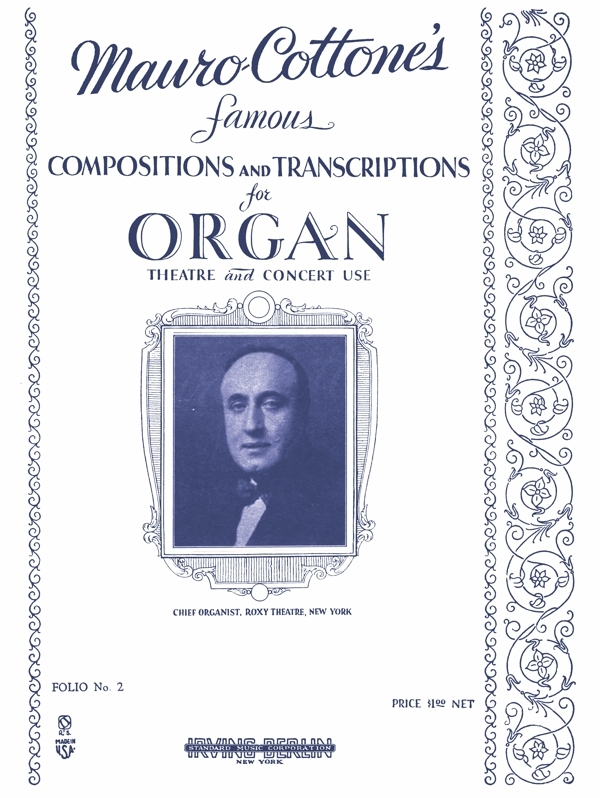 His first American concert appearance was at the Mendelssohn Hall in New York City on December 8, 1910, on the II/48 Frank Roosevelt organ, Opus 523 (1892). He was organist at Our Lady of Esperanza (known as the Spanish Church), where he played the II/10 Austin organ, Opus 307 (1912), and St. Ignatius Loyola Catholic Church (c 1917–19), where he played the III/80 Hook & Hastings organ, Opus 2326, a 1913 enlargement of their 1896 instrument. In 1919, he began playing the organ as a substitute at St. Francis Xavier Catholic Church while their organist-director, Pietro Yon, was on tour. His work there included a concert of choral and organ with their Chancel Choir of boys and men at Aeolian Hall on May 15, 1919. Read the full biographical sketch on our Biographies Page.